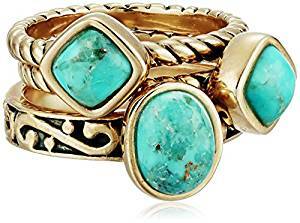 Affordable Turquoise Rings That Look Just Like the Real Deal! A good ring can turn any look from a 0 to a 100. Every woman’s favorite piece of jewelry, it is also the classiest. Trendy rocks or an ornate heirloom – there is absolutely no wrong ring. 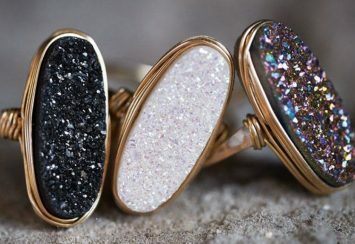 Besides the sheer gorgeousness of rings, they have immense emotional value too. In fact, rings top off any momentous occasion. Take weddings, for instance. 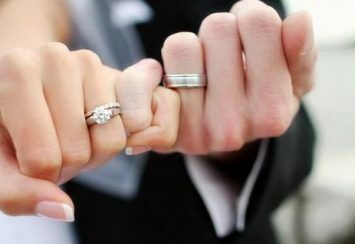 The perfect circle of a ring symbolizes an eternity of love between the couple while the placement of the wedding ring, on the fourth finger of the left hand, is said to have a vein which leads straight to the heart. Graduation is yet another opportunity to present a ring to your beloved. As one is ready to enter the next great phase of their life, what could be a more precious gift than a beautiful ring with personalized engraving? Fiery rubies or sparkling solitaires, in the realm of rings, we have seen it all. Gemstones of every shape and size, for every occasion you could possibly conceive of – ring designs hardly surprise as anymore. For those of who’ve seen enough of the same and are looking for something just a bit special, turquoise is what you are looking for. Vastly underrated as the same old glitters and gold gobble up the market, a turquoise ring is a statement piece for the one who stands apart and stands tall. Wondering how the unique blue-green hue translates onto jewelry? 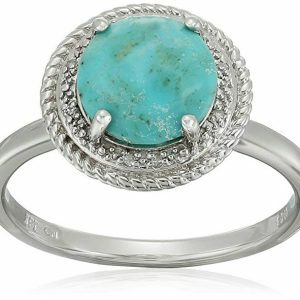 Here are 15 of our favorite turquoise rings which are complete showstoppers. For every look and occasion, turquoise is about to be your new best friend. To begin with, our turquoise parade, let’s start off easy. In the beautiful world of all things turquoise, the Cafa Flower Style turquoise ring is a very affordable trinket but do not be fooled. It is outrageously gorgeous and definitely not mainstream. 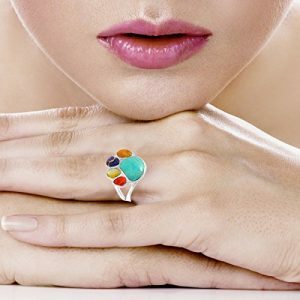 If you thought turquoise jewelry is all about simplicity, this ring is a mind-blowing surprise. 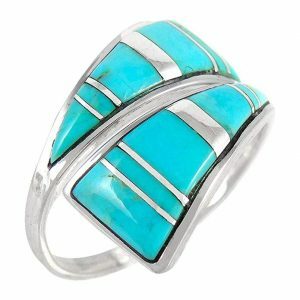 The large turquoise is mounted on top of the ring with a bezel setting. Big, smooth and polished to the point it shines – it is difficult to tear your eyes away from the gem and it is impossible to tell that it is indeed a man-made stone. Its coloring is more on the greenish side as the stone is stabilized for a more enhanced color effect. The beauty of the ring is in the deep veining of the stone. Dark and branching throughout the turquoise, it is anything but subtle. The marbling appearance makes this ring a standout piece and it is bound to bring tonnes of compliments to anyone who wears it. Moving on to the setting of the ring, this is where the ring is truly special. Encased in a metal alloy of the finest quality, intricate carvings dotted with rhinestones are laid over it on the upper and lower parts of the stone. On one side of these carvings, a beautiful flower, shaped out of metal and rhinestones, is placed on top. 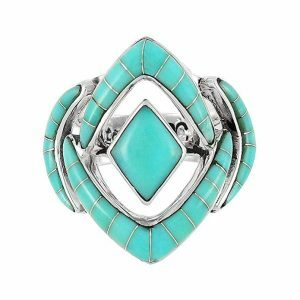 The attention to detail by Cafa is very visible as the ring is enwrapped in gorgeous patterns and the glistening turquoise is perfectly molded into it. There is a certain goth quality to the ring. So, if you want to bring a pop of color to your all-black ensemble without breaking away from the theme, the Cafa Flower Style turquoise ring is the right pick. However, being synthetic, it is prone to chipping and damage with rough use. So, use it with care and bring it out only when you really want to dazzle. At such a low price point, you can never go wrong with this turquoise beauty. 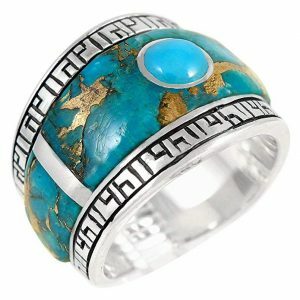 If you thought turquoise jewelry lacks elegance, this ring will shake all your beliefs to the core. Simple, sleek and uniquely stylish- if you are a woman with a refined taste that’s hard to satisfy, the Turquoise Network Genuine Turquoise ring is your match. Turquoise Network specializes in, you guessed it, everything turquoise. Earrings, pendants, rings, and bracelets in any color of turquoise there is and in an astonishing range of styles, you can bet the Turquoise Network knows what they are doing. This ring is yet another stellar gem in their collection that has us floored. The turquoise in the ring is a beautiful sea color and is about 2 carats. Being naturally mined, the greenish pigmentations on the stone verify its authenticity. Besides, the turquoise has also been chemically treated and stabilized to make the color pop even more. This ring itself has open ends, so it wraps around your finger with two triangular turquoise portions converging in the middle. The sterling runs between the turquoise in thin and thick columns. Although Turquoise Network officially offers a bunch of different sizes from 6 to 11 for the ring, the open ends mean it is adjustable, a feature which is usually absent in most rings. Quite malleable, you also need not worry about putting a dent in the silver. Made from 925 sterling silver, the standard quality of silver in global markets, and a genuine turquoise stone, it is worth the price. Unlike most other rings, it doesn’t turn the finger green with prolonged usage. However, if you do notice a bit of graying around the edges, it’s time you clean it and your ring will be as good as new. 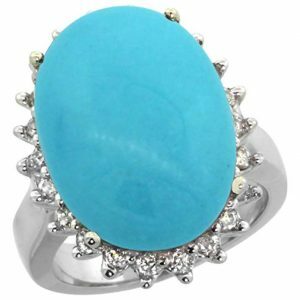 This genuine turquoise ring, brought to you by Turquoise Network, easily transitions from your office wear to party time with its sleek versatility. At a moderate price level, this ring also makes for a classy gift for your loved ones. Unconventionally chic and unapologetically unique, this is for the woman with a big personality and beautiful taste. Wondering what to gift the love of your life when you’re on a budget? Contrary to popular belief, a special gift does not have to be outrageously expensive. And if she’s a woman with a vivacious personality but also knows when to dial it down, we’ve got the perfect fit. The Rope Turquoise Diamond ring by the Amazon Collection is a beautiful ring that she can simply not resist. With greenish hues and marbled pigmentation, the turquoise stone is treated to a smooth perfection. It is round cut and overlaid on the sterling silver setting, with 4 small diamond prongs pinning it on the front. The layer lining underneath the stone features ornate carvings on the silver while the layer below that is stylized like a thick, twisted rope. At a very reasonable price, the fine craftsmanship of the ring speaks for itself and lends an expensive touch to its overall look. This ring is not a solitary piece. The collection also offers a rope turquoise pendant necklace and drop earrings. So, if you love the whole turquoise aesthetic for yourself or want to gift a complete set to someone special and as unique as these turquoises themselves, dig in deep because this design does not disappoint. In case you are disappointed, you will be pleased to know that the Amazon Collection has a free return. For any reason at all, if this ring does not work for you, you will be receiving a full refund, courtesy of Amazon. Being part of Amazon’s curated collection means you most likely won’t be needing their free returns option. Part of the handpicked jewelry by a team of gemologists whose standards are as high as the sky, the ring passed several stringent inspections to earn its place on the list. Besides being privy to Amazon’s stellar customer service, you will also be receiving them in a customized package, making it perfect for gifts. The ring is made in China and the sourcing of the diamonds and the production complies with the Kimberley Process. This basically means that the diamonds used in the ring are conflict free and have been bought through ethical channels, not used to finance rebel movements in the region. This Rope Turquoise Diamond ring is subtle, classy and yet very fun and flirty. Give it to your girlfriend when you want to take your relationship to the next level; the diamonds speak for your commitment while the turquoise promises a fun time. It is also a very thoughtful gift to any of your loved ones – mother, wife, sister or daughter. If you’re a woman who wants to stay on trend, you can even get it for yourself. This brilliant ring is one purchase you won’t ever regret. 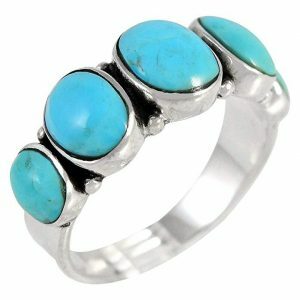 While we are discussing moderately priced turquoise rings which make for thoughtful gifts, we cannot leave out this gem. This Golden Greeting turquoise ring by Novica is a stunning vision in blue-green and interweaved with stories you will be telling your grandkids. It is a true keepsake, the kind you pass on to generations to come. Novica, in association with National Geographic, works to present to us the beautiful craftwork of artisans from all around the world. Their mission is simple: to spread happiness. And with the bohemian works of art which they bring, we can’t help but fall happily in love with their products. This ring comes all the way from India, handcrafted by a talented young woman named Aparna, who learned the craft from her father. Passionate about jewelry and spurred on by her husband, her hard work comes to glorious fruition in this labor of love. The turquoise used in is man-made, from resins and dye. It is also composite i.e. made from fragments which are held together. The cracks in the fragments of this ring are bonded together in majestic golden webbed veins, one of the two most prominent features of the ring. The other prominent feature is the intricate roped design surrounding the turquoise. Snaking all over the 0.925 sterling silver ring, it is detailed to perfection by Aparna. The Golden Greeting ring comes in a jewelry pouch with gorgeous embroidered elephants. If you thought this could not be any more enchanting, there is also a story card inside which verifies the quality and authenticity of the ring with a small glimpse into the lives of these wonderful artists. The ring is perfect to wear to a cocktail party. It is a statement piece, effortlessly stylish and a conversation starter. Pair it with a little black dress, or as called in fashion lingo, an LBD, and a turquoise clutch and you are ready to steal the show of any party you walk into. As a gift, this is the kind which moves the receiver to tears. Gorgeous and regal, sentiments seeping from every corner and a moving history behind it all- this is for the lover of global culture, the one who appreciates art, beauty and the hard work that goes into them. It is natural to be nervous about finally popping the question to your lady love. But with the right ring in your hand, nestled in a beautiful plush box, you will be surprised by the ease which you step into the next phase of your relationship. So, calm down and let this stunning ring by Bonyak jewelry do the talking. The turquoise used in the ring is a Cabochon gem. This means it has been polished to a shiny surface but is not faceted and therefore, doesn’t have a prismatic effect. It is a genuine turquoise, cut into a smooth oval of the dimension 10 x 8 millimeters and overlaid on a platinum setting, holding it in place with 4 prongs. Two bands of diamonds extend halfway through the ring, starting from the turquoise and weighs 1/10th of a carat. The ring itself is made of precious platinum, making it an ideal choice for the more significant occasions of one’s life. Bonyak Jewelry has been offering high-end jewelry at affordable prices since 2010 and they clearly know what they are doing. The turquoise platinum ring is one of their best items- simple, elegant, and one of a kind. For the quirky girl who lives in the moment, this ring is sure to win her over. Turquoise gem is made for the quirky fashionista- the wild free spirit with a burning need to stand apart from the crowd. Thankfully, we’ve got the perfect ring for this wildling, the Statement Ring by Turquoise Network. This is one of the funkiest turquoise rings in our list and it is steeped in quality. 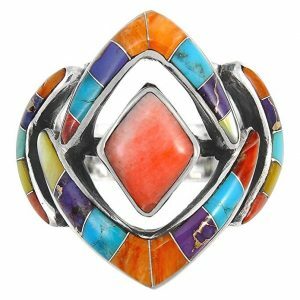 Reminiscent of Navajo jewelry, it is bright, colorful and a showstopper. The ring is made from 0.925 sterling silver and styled in mosaicked inlay with fragments of genuine blue and purple turquoise, spiny oyster shells in red and orange, and mother of pearl. The ring, in its explosion of colors, has a life of its own to brighten up even the gloomiest of days. The gemstones used are color enhanced and stabilized. The marbling veins are also prominent in the stones, making them even more lifelike. Because of its marquise spiral of the ring, it has an open end on the front through which the finger is visible. The ring itself is 1 inch long and 1 inch wide. With such a flamboyant color scheme, it is impossible not to notice it. While you can save it up for occasions where you want to dress to impress, this ring can also be worn as part of your everyday look. So, maybe the in-your-face multicolored turquoise is not your jam. Turquoise Network’s collection ensures you don’t have to go empty-handed. And this single toned turquoise is a calming vision for the eyes which doubles as a style statement too. The turquoise in this ring is a soothing aqua. Designed exactly like the Turquoise Network Gemstone Statement Ring in Sterling Silver & Genuine Turquoise Gemstones Sizes 6 to 11 from the 6th place on our list, this one features just the aqua turquoise, genuine and color-treated, although the veins are less visible in this solid stone. The sterling silver setting and the dimensions of the rings are still the same. Despite the nifty craftsmanship of the ring, it is quite lightweight and comfortable to wear. Besides, it is strong and sturdy, thanks to the fine quality and treatment of the turquoise. This makes it a great option as a ring for regular wear or situations where your hands might get dirty. 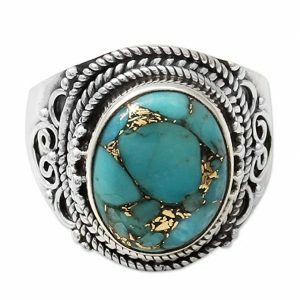 A unique cut and a yet more unique coloring, this genuine turquoise ring has just a sharp streak of boho without going overboard with it. A fashion statement in its own right, it is still a subtle choice. This ring is perfect for getting a light on-the-go dose of the latest trend in the fashion charts. Every couple is different. 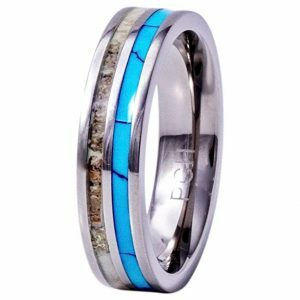 Luckily, with this ring, you get to show just how different you are from the crowd with matching wedding bands, fashioned from the striking combination of titanium, deer antler, and turquoise. PCH Jewelers is a Californian brand, specializing in unconventional wedding bands of the highest quality, since 1975. 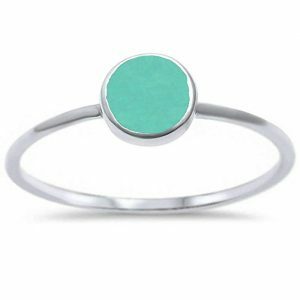 This titanium turquoise ring, roughly 6 mm, is one of their bestsellers. Genuine turquoise with marbled veins inlaid on one half and the antlers of white-tailed deer on the other, this is a beautiful wedding band with a stunning color combination. The wedding band is made of titanium, strong and resistant to rough wear. The turquoise and antler is flat-topped and smooth while the inside of the band is smooth too with “PCH” engraved on it and is comfortable to the touch. Lightweight, durable and stunning- this wedding band is unlike any other. To forge your marriage with a beautiful resilience, this ring is a great place to start. 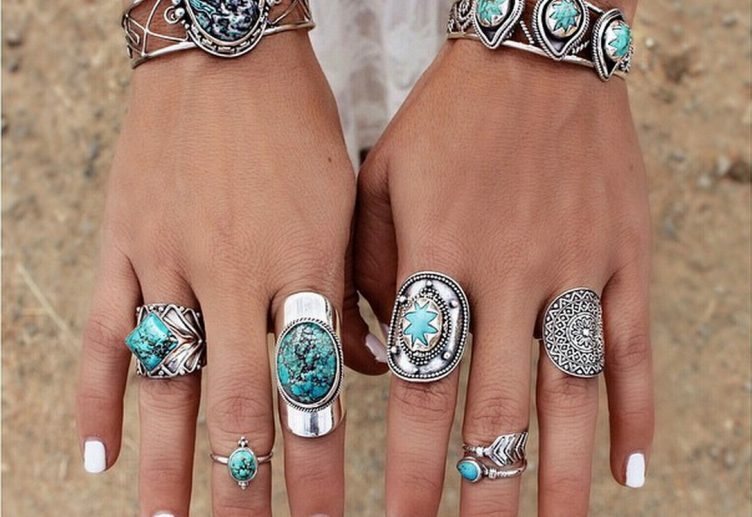 Who could ever have enough of turquoise? If you want to bask some more in the glorious hue of this gem, the Multishape Turquoise Trio set by Barse is what you’re looking for. Barse Jewelry is an international brand and produced uniquely crafted jewelry, made from semiprecious stones and gems, stylized in unconventional cuts and designs. Their products are made exclusively in Thailand by master crafters. This turquoise trio set consists of 3 bronze bands which you can stack on your fingers or wear as standalone rings. 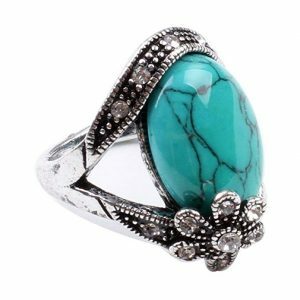 The middle ring is ornately carved in a painted black background and has a large oval turquoise stone. The other two rings are a little smaller, with the bands crafted in twisted ropes, and has a princess cut turquoise ring each. This is a gorgeously glistening ring set which you can wear in more than one way. Finely detailed with bronzed perfection and an ethnic vibe, this is the accessory which you can take your vacation outfit to the next level. This will also be a wonderful gift for someone who is obsessed with turquoise. Barse Jewelry is a turquoise lover’s dream. They’ve got something for everybody. And this genuine turquoise ring of theirs is an ode to those who like their turquoises the way they’re meant to be- simple, large and polished to an opaque finesse. 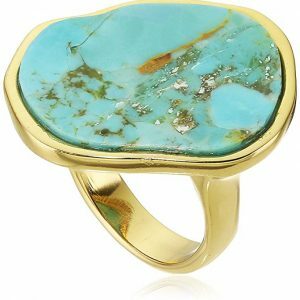 This ring features an oblong turquoise stone, 1.25 inches long, bezel set into a gold-toned bronze. The turquoise stone makes quite a statement. It is large, a beautiful blue color and faceted with greenish-brown marbling, which gives it an almost raw, authentic appearance. Nicely rounded and laid into the smooth gold setting, this ring was made in Barse’s production facility in Thailand and reflects their fine workmanship. Because the turquoise is such a standout feature of the ring, it would be a very thoughtful gift for a December baby, the birthstone of the month being turquoise. It would also be great as a graduation present as the ring is somber and professional, not to mention extremely elegant! If you are the kind of woman who is always off to meetings and corporate parties, this stunning rock could be a perfect sidekick for you as you conquer the world. 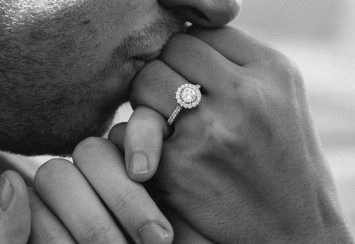 An engagement ring which can set pulses racing and hearts throbbing- what could be a better start to a lifetime of togetherness? The Natural Turquoise engagement ring by Silver City Jewelry is everything a woman could ask for. It’s sparkling, romantic and one of its kind. Silver City Jewelry has been making wedding jewelry for the past 25 years; a true maestro of the art. This ring is one of the most unique ones in their collection and is a total heart stealer. The turquoise is a large, smooth oval of the dimensions 18 x 13 mm and devoid of any lines, veins or demarcations, making it a right fit for an engagement ring. The stone is lined with glittering diamonds of 1.06 carats in a halo accent, which adds a classic celestial quality to the ring. The ring itself is made of 10k white gold, a beautiful yet sturdy choice. It comes in a beautiful red box with golden trimmings. This turquoise engagement ring is fit for royalty. Heavy, intricate, sparkling yet subdued- this is a perfect choice for the bold couple united by a lasting love and refined taste. When backed by the finest quality, even the simplest jewelry shines like a star. 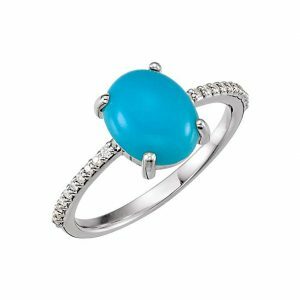 The round turquoise ring by Oxford Diamonds proves how years of experience, not showy trinkets with a hefty price tag, is your best bet for jewelry that stuns. Oxford Diamonds has been working with diamonds and precious gemstones for the past 35 years to craft the finest jewelry at low prices. This ring of theirs is made from 0.925 sterling silver, polished and glistening. The turquoise is 6 mm wide with very little marbling and is completed in the silver. The stone is, however, artificially made. The ring is small and dainty, with a thin band which comfortably slips onto the finger. Being made of the finest raw materials in the country, it does not chip off or tarnishes nor does it leave discolorations on the skin. This adorable globule of turquoise can easily be a permanent on your finger as daily wear; you don’t even need to take it off in the shower. Besides, when you want some feminine trinket to blend in with your overall look, there could not be a better ring. 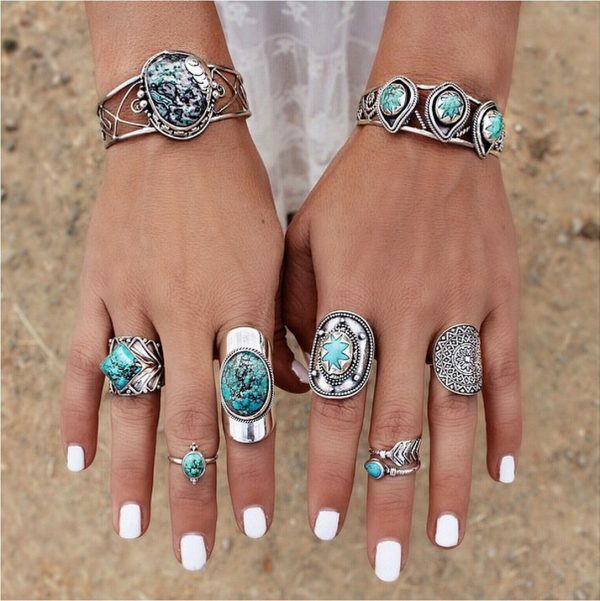 Turquoise Network’s amazing collection of turquoise jewelry never fails to astound us. In all cuts and designs possible, and every price range under the sun, this brand is a haven for all those addicted with the heavenly hues of turquoise. This ring serves a heady hit of turquoise, and with a very affordable price too. This design is available in 3 color choices- a true aqua turquoise, an inky purple with thick copper matrix throughout the stone and lastly, multicolored stones with a golden matrix in some of them. There are 5 oval stones, bezel set in separate silver holdings while each stone is 1/4th of an inch. The gems are, of course, completely genuine and have been stabilized for enhanced color. The ring is made of 0.925 sterling silver of premium quality, as is expected from Turquoise Network. With a top-notch design, variety is always appreciated and Turquoise Network has truly outdone itself this time with such beautiful colors. You can choose the one which appeals most to your aesthetic or better yet, orders all 3 of these for different occasions. Wear it to a casual party or to school and let the bohemian princess in you shine. Dogs are a man’s best friend and turquoise is the gem we just can’t stop obsessing over. Put the two together and you have an accessory that goes straight to the heart. 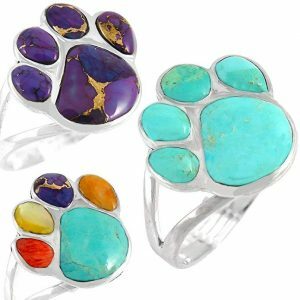 If you are wondering what to get your pet lover friend or would like to express your love for the furry friends yourself, this Dog Paw Turquoise ring by Turquoise Network is what you need. Shaped like an adorable tiny dog paw- the diameter of the ring is 2/3rds of an inch- with 5 turquoise stones, this is the cutest turquoise jewelry in our list. The ring is made of 0.925 sterling silver while the stones themselves are available in 3 color options- blue turquoise, purple turquoise with copper matrix and multicolored turquoise. These rings are sold individually. So, choose your color and go for it! We all have a friend in our lives who is completely bonkers for our muzzle nosed companions. They will definitely thank you for this sweet gesture in the form of a beautiful turquoise ring. In case you are that friend yourself, you know you are going to love wearing this to the dog park. You know we had to round off this list with the most eclectic of turquoise rings and from our favorite brand too, Turquoise Network. This ring is exactly how we envision turquoise jewelry to be – bold, unconventional and breathtaking. And if you admire turquoises for their stylish tenacity, this ring is for you. This is the kind of ring you see on trendy fashionistas like the Olsen sisters or Cara Delevingne as they bring high fashion to streetwear. With a wide band, which is 2/3rd of an inch it is only a little thinner than a cuff ring. It is made from 0.925 sterling silver which is engraved with thick black lines in a Navajo pattern on two sides. A thick band of inky turquoise, made gorgeous with a copper matrix, runs through the middle while a round blue turquoise is nestled on the centre. This centerpiece of the ring is small yet polished to the point it glistens. This is, of course, genuine turquoise, which has been treated for enhanced shine and longevity. In spite of having such unusual design, the ring is still a classy accessory which you can confidently rock anywhere. At a boardroom meeting, the club at weekends or a Turkish bazaar – there is no setting where this unique gem does not fit. Once again, this is a perfect reminder of why we love turquoises so much. If you are new to the azure world of turquoises, fret not. We answer all your questions about this glistening semi-precious stone. What does turquoise symbolize as a gemstone? Answer: Turquoise, since eons ago, has been used as the charm of love and friendship. The birthstone for the month of December, if your social life is taking a tumble, trust this opaque beauty to revive it. Besides, turquoise is also said to have a calming effect on the wearer which should come as no surprise, given the soothing blue tones of the stone. How can I tell genuine turquoises apart from the artificial ones? Answer: Apart from the obvious telltale which is the price of the stone, an additional pointer is to watch out for the color, matrix, and toughness of the stone. An artificial turquoise is going to have uniform coloring throughout since it is produced in man-made facilities. Natural turquoises, on the other hand, are bound to have some uneven color and mild imperfections. However, there are some genuine turquoises, which are as close to perfect uniformity as a real gemstone could be, but they are becoming increasingly rare and the available ones are exorbitantly expensive. The matrix we are referring to is the spider web-like structure which spreads out through turquoises. These can be golden toned, greenish or even plain grey. Basically, these are the remnants of the host rock on which the natural turquoise grew. In some cases, this matrix is extricated to make the turquoise more uniformly toned. However, it usually stays for a more exotic appearance although the web naturally erodes over time. To verify whether the turquoise you hold is real, drag your fingernail along the surface and if you are able to tell that the veins of the stone and the stone itself are at different heights, rejoice because this is a genuine turquoise. Finally, the hardness of the stone is a dead giveaway. Artificial turquoise is less hard than the genuine ones. If you are able to put a dent on your new turquoise ring with as much as your fingernail, you know it’s not real. Lastly, when shopping for jewelry, turquoise or any other kind, go for the reputable stores with reviews you can get behind. Besides, with the shooting prices of genuine turquoises and their increasing rarity, there is no shame in purchasing artificial turquoises as long as you are aware of the fact and are paying the right price. What are the different treatments given to turquoises? Answer: Turquoise being softer and more porous than the average gemstone, it needs a little bit of help to become the beautiful and long-lasting jewelry that we love. Stabilized Turquoise- Nobody wants their turquoise jewelry to fall apart in a matter of months. Stabilization, by pouring epoxy or resin on the stone, makes it stronger and locks in its natural pigment. Color Treated Turquoise- To make the color of the turquoise pop, a dye is injected into the stone. This technique is also used to make the matrix contrast with the natural color of the turquoise. Reconstituted Turquoise- Turquoises of very small size or of low quality are crushed into a powder which is formed into desired structures with dye and adhesive agents. Reconstituted turquoises usually have very little genuine turquoise in them and are mostly filler material. How do I clean my turquoise jewelry? Answer: The secret of any jewelry which remains as good as new for years lies in proper care. Clean your turquoise jewelry with a soft bristled brush and water, and dry it up immediately. Do not submerge your turquoise in water or bring it into contact with any sort of soap or detergent. Commercial jewelry cleaners are also a no-no as their stringent formula can damage the soft stone. Cleaning it from time to time with a jewelry polishing cloth will, of course, prevent any long-term damage.